I am a professor of environmental engineering and founding director of the MS program in Sustainability Management at Stevens Institute Technology, New Jersey. Between 2008 and 2015, I was a professor of environmental geochemistry and founding director of the environmental management PhD program at Montclair State University, New Jersey. 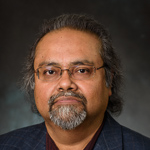 Prior to that, I served as an assistant (2000-04) and associate professor (2004-08) and associate dean of Graduate Studies and Research (2006-08) at the University of Texas at San Antonio. I graduated with a PhD in geochemistry from the University of Tennessee (Fall 1997) and worked as a postdoctoral scientist in soil and water science at the University of Florida (1998-00). Thus far, I have advised/advising 12 PhD students and 18 MS students, and trained 15 postdoctoral research associates. I have so far published 100+ journal articles, 15+ book chapters, and 200+ technical abstracts and conference proceedings. I have authored/edited 3 books/research monograph, and have so far generated more than $8 million in grant funding to support the research activities of my group. According to Google Scholar(http://scholar.google.com/citations?user=h1qTjQ4AAAAJ&hl=en), as of Spring 2018, my publications have been cited more than 3000 times, with an h-index of 30+ and i-10 index of 65+. I am a Fellow of the Geological Society of America, and the founding principal of SIROM Scientific Solutions, LLC, an environmental R&D startup. I am an adjunct professor at Michigan Technological University and University of Massachusetts at Boston. I am the editor-in-chief of Current Pollution Reports (Springer), technical editor of International Journal of Environmental Science and Technology (Springer), and associate editor of Soil Science Society of America Journal. I serve as a reviewer for many journals, and in panels of several grant funding agencies, including NIH and NSF.